Active duty, veteran, and ROTC students are the focus of Military Appreciation Week on Monday-Friday, April 11-15. Operation: Careers for Heroes is a job fair for veteran students. Active duty, veteran, and ROTC students can meet with employers at the fair 10 a.m.-2:30 p.m. Thursday, April 14, in Room 133 of the Maverick Activities Center. More than 45 companies will be at the fair for internships and part-time and full-time positions. 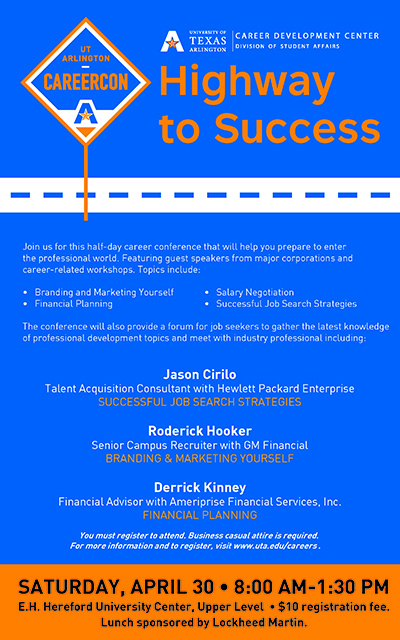 Register online for workshops on entrepreneurship, dressing for success, and interview skills. For more details, contact Loren Hitchcock at 817-272-0546 or loren.hitchcock@uta.edu. Other events this week include a barbecue fundraiser, Military Appreciation Night at the Mavericks baseball game, a souvenir T-shirt sale, and a drawing for a suite for two at the May 13 Texas Rangers vs. Toronto Blue Jays game. Read more about UTA's Military Appreciation Week. Enjoy food, Maverick fellowship, and music at the Jazz Brunch during the Main Street Fort Worth Arts Festival on Saturday, April 16. Main Street runs Thursday-Sunday, April 14-17. Brunch is served 11:30 a.m.-2:30 p.m. at the UTA Hospitality Suite at Main and Ninth streets in downtown Fort Worth. Tickets are $15 per person and free for children 5 and younger. Register online by Wednesday, April 13. While you dine, listen to performances by the Jazz Ensemble at 11 a.m., the Jazz Orchestra at 12:30 p.m., and the Jazz Combo 1 at 2 p.m., all on the Main Stage at Main and Ninth. Stop by the UTA booth for fun giveaways and lots of information about upcoming events and programs offered in Arlington and Fort Worth. For more details, contact the Office of Alumni Relations at alumni@uta.edu or 817-272-5297. Find parking information at fortworthparking.com. 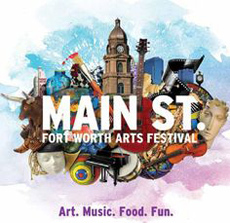 The largest four-day event in the Southwest, the Main Street Fort Worth Arts Festival is a nationally recognized art showcase with over 60 live performances, a variety of food options, and activities for all ages. 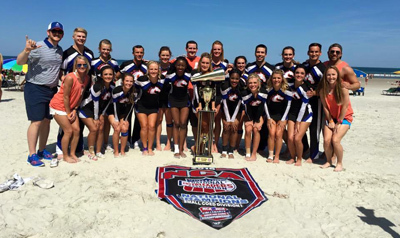 UTA's cheerleading squad won its fourth overall and third consecutive national championship at the National Cheerleaders Association annual competition in Daytona Beach, Fla.
Watch videos of the preliminary performance and the finals competition for the small coed division 1 title. See the Maverick dance team perform in preliminary competition for jazz dance. UTA Libraries is ready to help students with tools and techniques to complete their final course assignments. Experts will assist students with project planning, software/technology, citation/writing, and managing group work/dynamics in one-on-one conversations. The workshops are 8 p.m. today Tuesday, April 12, and noon Wednesday, April 13, in the Academic Plaza near Room 203 in the Central Library. 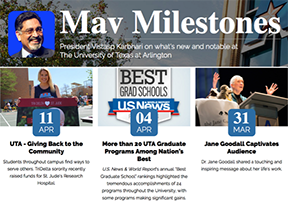 Fundraising fun, top rankings, and a global legend are in the latest blog posts from President Vistasp Karbhari. Read more. University departments, offices, and programs are looking for student workers for summer and fall. Check out these jobs and learn more at the Career Development Center. Join the summer conferences team and assist more than 8,000 guests who will come to campus. Both live-in and hourly positions are available. Apply on Snap Jobs for conference assistant (#8934) and office assistant positions (#8935). A supplemental application is required and is available at uta.edu/conferences. University Tutorial and Supplemental Instruction (UTSI) is looking for motivated students to become tutors and SI leaders for the fall semester. Tutors and SI leaders are personable students who successfully earn As and Bs in their courses and want to share their knowledge with their fellow Mavericks. For details, visit uta.edu/tutoringjobs. The Student Money Management Center provides financial education to students to help them succeed while in school and beyond. Stop by to learn more about budgeting, savings, and credit awareness. Walk-in appointments are available 10 a.m.-noon Wednesdays in Room 212 of the Central Library. Share photos of your decorated graduation cap using #MavGrad2016 for a chance to win a UTA alumni prize pack filled with the ultimate UTA swag. Dress in your favorite 1950s outfit for the family-friendly Dance-A-Thon that supports the Student Emergency Assistance Fund. 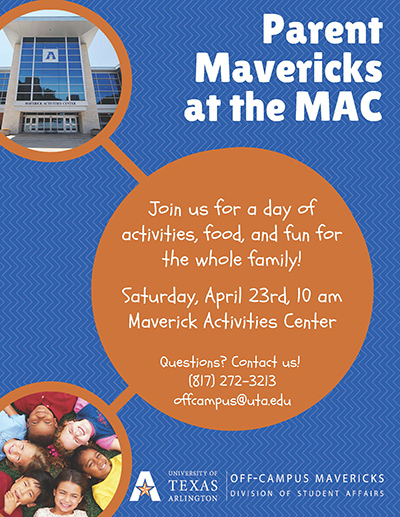 Students, faculty, staff, and alumni are invited to bring the family, hit the dance floor, see dance performances and demonstrations, and enjoy carnival-style games. 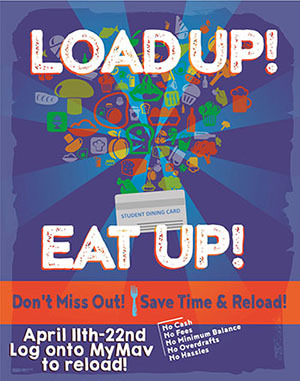 The fun is 3-11 p.m. Friday, April 15, in the Bluebonnet Ballroom of the E.H. Hereford University Center. EXCEL Campus Activities and Freshman Leaders on Campus sponsor the event. Students can meet the last candidate for director of Parking and Transportation Services at 7:30-8:30 a.m. Thursday, April 14, in Room 609 of the Business Building. Enjoy an evening at Six Flags Over Texas with discounted tickets that helps Arlington schools. The theme park hosts Education Celebration 6-11 p.m. Friday, April 15, benefiting UTA and AISD through the AISD Education Foundation. Tickets are only $20 plus tax. Advanced tickets are limited. No tickets will be sold at the gate. Special discounted parking is $10 per car at the gate. With each ticket, $5 goes directly to UTA's Student Emergency Assistance Fund. See the gift codes on the website. Use the code UTA. Complete a bike share survey for the Institute for Sustainability and Global Impact. A bike share program would allow students, faculty, and staff to check out a bicycle from one or more locations and return the bike at a later date. This will reduce congestion in parking lots, improve public health, reduce emissions, and create a cleaner, healthier, and more environmentally sustainable campus. Sharpen your interview skills at Mock Interview Day, hosted by the Center for Career Development. The event for all majors is 1-4 p.m. Thursday, April 14, in Room 216 of Davis Hall. Register online for your 30-minute spot. Employers will be here to ask you interview questions and provide feedback to help you prepare for real interviews. Complete a survey to help UTA develop a certificate in sustainability. The program will use a multidisciplinary approach to integrate business, society, and sustainability into a coherent program of study and engagement. The certificate would offer working professionals an opportunity to learn how to integrate the principles and values of sustainable practices. See the new website for UTA's Institute for Sustainability and Global Impact. The University of Texas Press is holding a spring online book sale for all campuses in the UT System. The sale runs through midnight Friday, April 15, on the UT Press website. All titles on the site already are 33 percent off. Students, faculty, and staff will receive a discount of 45 percent off the full retail price. To receive 55 percent off, use the code UTPS16. Sales tax and shipping apply. Representatives of Volunteer Income Tax Assistance (VITA) are available to help with figuring out your taxes. The free service is available 5-9 p.m. today, Tuesday, April 12, in Room B20 of the Central Library. Deadline to hold master’s exam or dissertation defense. Graduates participating in Commencement and their guests must have a ticket to attend the ceremony. Children age 2 and younger do not need a ticket. 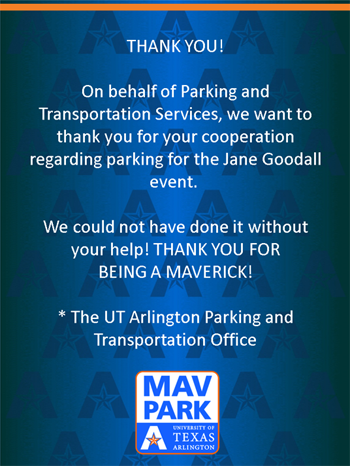 Look for instructions on claiming tickets in your UTA email accounts Monday, April 18. Visit the Commencement website for details on ticket quantities and availability. 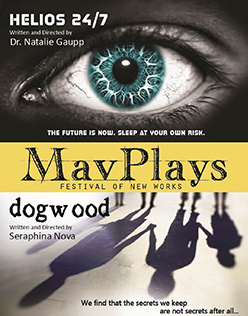 Theatre productions by playwrights-in-residence Natalie Gaupp and Seraphina Nova are featured in MavPlays, a year-end production showing the talents of theatre arts faculty, staff, and students. Dogwood by Nova explores three people still nursing the scars of childhood whose aging parents were not aware of the damage they caused. Showtimes are 8 p.m. Thursday, April 14, Saturday, April 16, and Friday, April 22, and 2:30 p.m. Sunday, April 24, in the MainStage Theatre of the Fine Arts Building. Helios 24/7 by Dr. Gaupp follows a businesswoman and her artist daughter at odds in a world where the need for sleep can be permanently expunged. Showtimes are 8 p.m. Friday, April 15, and 2:30 p.m. Sunday, April 17. The show repeats at 8 p.m. Thursday, April 21, and Saturday, April 23. Productions are in Studio 137 of the Fine Arts Building. Tickets are $7 for students, faculty, staff, and seniors and $10 for the public. MavPlays is produced by the Theatre Arts Department. Earth Day Learn more about taking care of Mother Earth. Free herb plants while available. 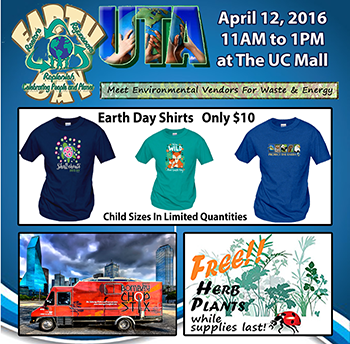 11 a.m.-1 p.m., University Center mall. Institute of Sustainability and Global Impact. Baseball Mavericks vs. Houston Baptist. Tickets $5, $3 students. 6:30 p.m., Clay Gould Ballpark. Also, vs. Georgia Southern, 6:30 p.m. Friday, April 15, 2 p.m. Saturday, April 16, and noon, Sunday, April 17; vs. Dallas Baptist. 6:30 p.m. Tuesday, April 19; and vs. Louisiana-Lafayette. 6:30 p.m. Friday, April 29. Athletics. Housing Fair Housing resources, options on campus and in Arlington. 10 a.m.-2 p.m., Palo Duro Lounge, E.H. Hereford University Center. The Shorthorn. Mavs Got Talent A showcase of performances by students. Free. 8 p.m., Rosebud Theatre, E.H. Hereford University Center. EXCEL Campus Activities. Homerathon A public reading of Homer's epic poem, The Odyssey. Text in English available in Room 305 of Carlisle Hall. Recitation in Greek and other arcane languages is encouraged. Homerathon T-shirts and coffee mugs for sale. Register to participate. 7 a.m.-10:30 p.m., University Center mall. Philosophy and Humanities. Spring Jazz Concert Performances by UTA's jazz program groups. Tickets $9 general public, $6 students and seniors. 7:30 p.m., Texas Hall. Music. Softball Mavericks vs. Louisiana-Monroe. Tickets $5-7, $3 students. 1 and 3 p.m., Allan Saxe Field.. Also, noon, Sunday, April 17; vs. Troy. 1 and 3 p.m. Saturday, April 30. Athletics. Men's Tennis Mavericks vs. Midwestern State. Free. 2 p.m., UTA Tennis Center. Athletics. Baseball Mavericks vs. Dallas Baptist. Tickets $5, $3 students. 6:30 p.m., Clay Gould Ballpark. Also, vs. Louisiana-Lafayette. 6:30 p.m. Friday, April 29. Athletics. Percussion Ensemble Concert Free. 7:30 p.m., Irons Recital Hall, Fine Arts Building. Music. Maverick Film Festival The competition features four-minute films by students. 7 p.m., Rosebud Theatre, E.H. Hereford University Center. Art and Art History. Friends of the Library Kathleen Kent, author of The Outcasts. 7:30 p.m., sixth floor parlor, Central Library. UTA Libraries. Symphonic Band and Winds Concert Free. 5 p.m., Irons Recital Hall, Fine Arts Building. Music. UTA Libraries: 'Score' Using Special Collections photos, the exhibit showcases the early days of baseball, basketball, and track; the end of Maverick football; and Olympians and Paralympians from UTA. Through April 30. Also, Academic Evolution: The University of Texas at Arlington runs through Aug. 31. Sixth floor, Central Library. UTA Libraries. Safe Zone Training Register online. 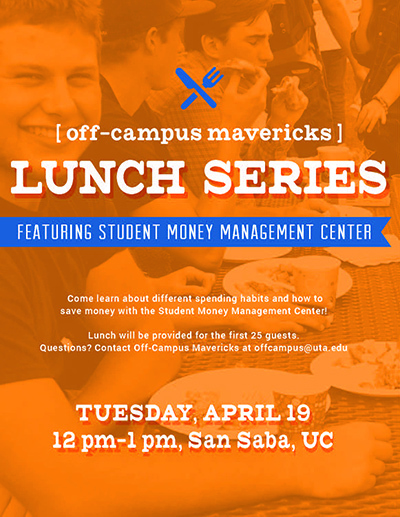 1-4 p.m., San Saba Room, E.H. Hereford University Center. LGBTQA Program. Moritz Speaker Series Ironman athlete Elmar Sprink of Germany and sports cardiologist André La Gerche of Australia are speakers for the inaugural series. Sprink is considered the fittest heart transplant recipient in the world. Dr. La Gerche developed a cardiac MRI test that can examine patients while exercising. Free. 4-6 p.m., Lone Star Auditorium, Maverick Activities Center. Moritz Speaker Series, Nursing and Health Innovation. 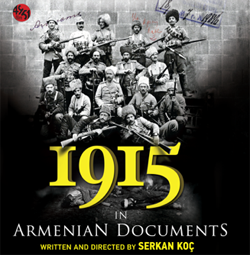 Documentary screening: 'The Story of 1915 in Armenian Documents' The Turkish Student Association at UTA hosts a screening of this film examining the end of the Ottoman Empire during World War I and the genocide aimed at the Armenian people. The film will be followed by a panel discussion. 6:30 p.m., Pedernales Room, E.H. Hereford University Center. Center for Mexican American Studies Distinguished Lecture Leo Chavez of the University of California, Irvine, "From Amnesty to Anchor Babies: Immigration Discourse Over the Last 50 Years." 7 p.m., sixth floor parlor, Central Library. Center for Mexican American Studies. Note-Taking Skills Learn to take better notes. Snacks provided. Noon-1 p.m., Room 104, Preston Hall. Also, Thursday, April 21. University College. 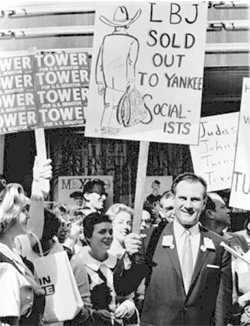 Sunbelt Politics: The Rise of the New Right Author Edward H. Miller of Northeastern University, Boston, and Michelle Nickerson of Loyola University, Chicago, discuss the importance of Dallas Congressman Bruce Alger, right, and the Republican Southern strategy in 1956. 12:30-2 p.m., sixth floor parlor, Central Library. Center for Greater Southwestern Studies. Executive Presence: Powerful Actions, Communication, and Appearance Teri Bump of American Campus Communities demonstrates how communication, gravitas, and appearance can drive your career advancement. Register online. 3:30 p.m., Rio Grande Ballroom, E.H. Hereford University Center. New Maverick Orientation. Biology Colloquium Series Adam Siepielski of the University of Arkansas, “A Niche for Neutrality in Structuring Species Assemblages.” 4 p.m., Room 124, Life Science Building. Biology. Art Lecture Mohamed Keshavjee of the Institute of Ismaili Studies in London, author of Into That Heaven of Freedom: The Impact of Apartheid on an Indian Family’s Diasporic History. 5 p.m., auditorium, Architecture Building. Art and Art History. Points of Transition: Scott Ingram Scott Ingram, senior lecturer of anthropology, discusses topics related to change and the transfer experience. Noon, lobby, Ransom Hall. Maverick Transfer Connection. Focus on Faculty Julienne Greer, associate professor of theatre arts, Empathy and Embodiment: The Interdisciplinary Collaboration of Theatre Arts and Social Robotics. Noon-1:30 p.m., sixth floor parlor, Central Library. UTA Libraries. Presentation Tips Sharpen your skills for presentations. Snacks provided. 4:30-5:30 p.m., Room 104, Preston Hall. University College. Women’s and Gender Studies Brown Bag Lecture Stephanie Tavera, English doctoral student, "Conspiracies of Silence: Sexing the Body in Nineteenth-Century Women's Medical Fiction." Noon-1 p.m., Room 200, Trimble Hall. Women's and Gender Studies. The 2016 Presidential Election Political science department experts Brent Boyea, Rebecca Deen, Thomas Marshall, and Allan Saxe discuss this year's presidential candidates and election process. Noon, Room 115, University Hall. 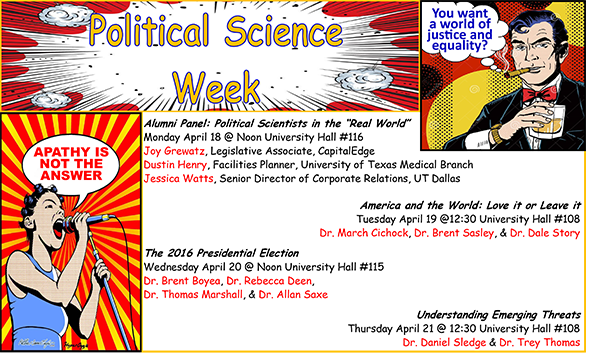 Political Science. Adventures in Antiquity Symposium Christopher Fuhrmann of the University of North Texas, "Police Brutality in the Roman World." 3:30 p.m., Room 2102A, Fine Arts Building. Philosophy and Humanities. Biology Colloquium Series Jason Head of the University of Cambridge, “Snaking Through Morphospace: Anatomical Test of the Role of Regulatory Genetics and Ecology in the Evolution of a Hyperdiverse Clade.” 4 p.m., Room 124, Life Science Building. Biology. Studying for Tests Battle test anxiety and plan ahead for exams. Snacks provided. Noon-1 p.m. Tuesday, April 26, Room 104, Preston Hall, Also, Thursday, April 28. University College. Texas American College of Sports Medicine Lecture Hirofumi Tanaka, director of the Cardiovascular Aging Research Laboratory at UT Austin, “Masters Athletes: Super Humans with Gray Hair and Wrinkled Skin?” Noon Wednesday, April 27, Lone Star Auditorium, Maverick Activities Center. Kinesiology. Social Work Colloquium Joanne Sobeck, associate dean and director of the Center for Social Work Research, “Building Research Capacity.” RSVP to michael.olayiwole@mavs.uta.edu. 1-2 p.m. Wednesday, April 27, Room B107, Social Work Complex B. Research and Professional Development, Social Work. Frontiers in Science Edward F. DeLong of the University of Hawaii at Manoa, “Towards 4-Dimensional (Eco) Systems Biology in the Sea.” 1 p.m. Thursday, April 28, Carlisle Suite, E.H. Hereford University Center. Biology. Homeward bound: Senior infielder Darien McLemore heads home in Sunday's 8-4 win over Louisiana-Monroe. 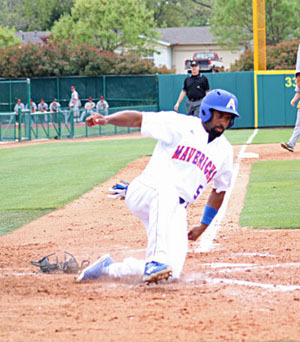 The Mavs take on Houston Baptist at 6:30 p.m. today, Tuesday, April 12, at Clay Gould Ballpark. • Maverick baseball won against Louisiana-Monroe 8-4 on Sunday. The Mavs are 18-15 overall and 5-7 in Sun Belt play. The team takes on Houston Baptist at 6:30 p.m. today, Tuesday, April 12, at Clay Gould Ballpark. Next up is a three-game series with Georgia Southern Friday-Sunday, April 15-17, and Dallas Baptist Tuesday, April 19. • After 4-0 sweeps over Louisiana-Monroe and Texas State, the women’s tennis team plays North Texas Saturday, April 16, before heading to the SBC Championship on Thursday, April 21, in New Orleans. • In softball, the Mavs fell 7-3 to South Alabama on Sunday. The team is 25-11 overall and 4-8 in conference play. Next is a three-game series against Louisiana-Monroe beginning at 1 p.m. Saturday, April 16, at Allan Saxe Field. • UTA track and field teams heads to the Mt. SAC Relays in Norwalk, Calif., Thursday-Saturday, April 14-16. The team faced collegiate and pros last Saturday at the Baylor Invitational in Waco. • The men's golf team wraps up the Jim West Intercollegiate in Bastrop, hosted by Texas State, today, Tuesday, April 12. Last week the team came in 15th at the Old Waverly Collegiate Championship hosted by Mississippi State. • Men’s tennis team plays Midwestern State at 11:30 a.m. Saturday, April 16, at UTA Tennis Center. Upcoming intramural sports deadlines are table tennis, Thursday, April 21; wheelchair football, Monday, April 25; battleship, Monday, May 2; FIFA video game, Wednesday, May 4; and poker tournament, Thursday, May 5.